A company founded by a Loughborough University graduate to develop floor tiles that generate electricity from footsteps is celebrating its first permanent installation in a school and a contract for the Westfield shopping centre on the Olympic site. 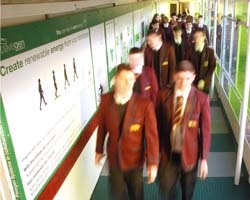 Pupils at the Simon Langton Grammar School for Boys in Canterbury are now lighting up a corridor simply by walking through it. The tiles will also help the shopping centre in the Westfield Stratford Park ensure it meets stringent targets for environmental sustainability. The technology turns kinetic energy from footsteps into electricity to power street lighting, information signage and other applications that spring into life when people approach them. Produced in the UK using recycled tyres, Pavegen tiles are the brain child of Laurence Kemball-Cook who set up a company in 2009. The product has won awards from the Technology Strategy Board and the Chartered Institute of Builders and has been described by Science Minister David Willetts as a "great example of British innovation". Pavegen is currently being showcased at the Science Museum in London, in the £4.5-million Atmosphere Gallery opened in December by the Prince of Wales, who expressed interest in the wide range of Pavegen applications. 1. High resolution photos are available from Anna Seddon. Flexing just 5mm, Pavegen slabs absorb the kinetic energy produced by every footstep, creating 4-10 watts of electricity. The energy is either stored within the slabs or distributed to nearby street lights, information displays and even electrical appliances such as computers and fridges. The energy generated from five slabs can illuminate a bus stop throughout the night. It is estimated that with heavy usage a Pavegen installation could pay for itself within two years, with each slab targeted to have a five-year lifespan. The technology is currently suitable for indoor use and Pavegen are finalising the design for the outdoor units.